Packing for a vacation is always a challenge, so every time I take a vacation, I like to do a fashion post showing what I wore. These posts tend to be very popular because everyone is always looking for ideas on how to pack light, yet still look great in those vacation photos! 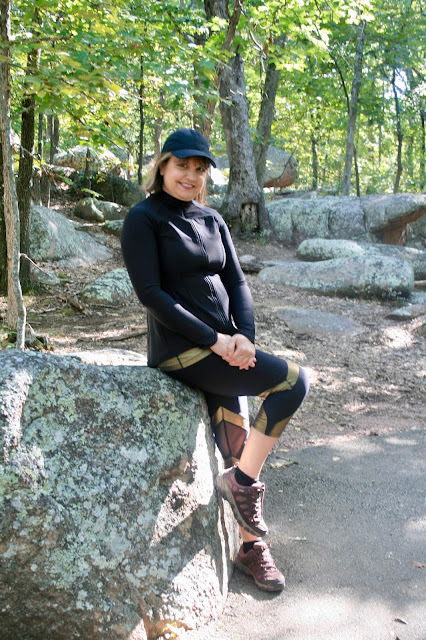 This vacation we did a lot of hiking in state parks so the majority of my outfits are activewear. Activewear has become so fashionable lately that women are wearing it for more than just exercising. I love to wear activewear when traveling because it's so comfortable. Because I wore so much activewear, and even wore some outfits more than once, I took the least amount of clothes I have ever taken on any vacation before. I was so proud of myself to only have one small suitcase, a garment bag for my dresses, and a toiletry bag. Normally I'd have at least two large suitcases full of clothes! Well let's begin. Each outfit is listed by the day of the vacation, what I did that day, the temperature, and an explanation of why I chose the outfit I wore on that day. Traveled six hours by car to Illinois, took a long walk, temperatures were in the eighties. I chose to wear a activewear skort that I previously showed you in THIS POST. It is cool and comfortable to wear for long hours in the car and for walking. I completed the outfit with Adidas Courtset Sneakers, a graphic tee, and a cross body bag for security reasons. We went to church, out to lunch with our children, then we hit the road for a four and a half hour drive to St. Charles, Missouri. The temperatures were in the eighties. If you read Wednesday's Travel Post, you would know we had a hard time getting into our hotel room. It really put a damper on our evening, so we never took any pictures. 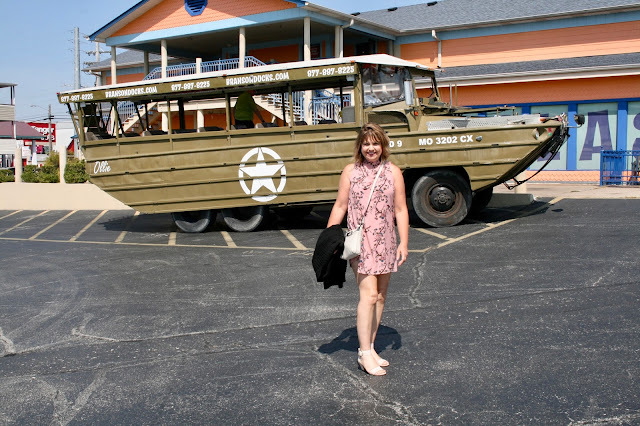 But I did end up wearing the same outfit again, when we went out to dinner in Branson, so you can see it below on Day 7. We spent the day walking in the historic city of St. Charles. Then we drove an hour and a half to Farmington, Missouri to have dinner and spend the night. The temperatures topped at 100 degrees...the hottest day of our vacation! 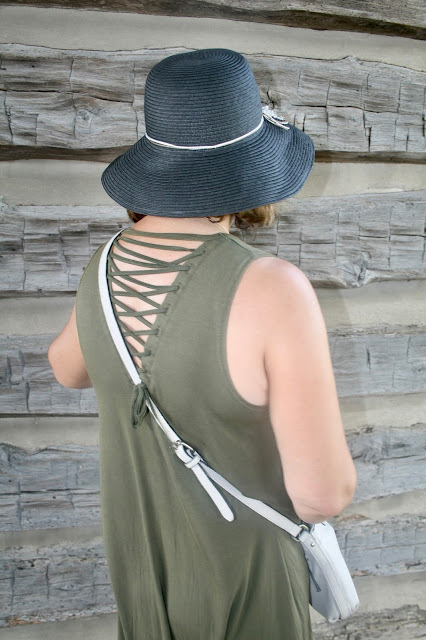 To beat the heat and be comfortable in the car, I wore a new lightweight jersey dress from Francesca's, black flat sandals for easy walking, a straw hat to keep the sun off my face, and a cross body bag for security reasons. The dress has the cutest lattice back! 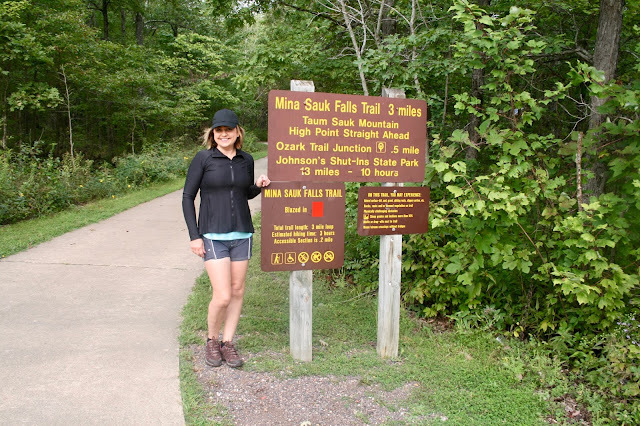 We went on several rigorous hikes in multiple state parks. It was cool in the morning, but the temperatures did rise to the eighties by the afternoon. In the morning it was cool, soI wore a black athlesiure jacket that I picked up at T.J. Maxx. Underneath I had on a shorts and tank athletic suit from JCPenney that can be used to swim in, kayak, or exercise. It dries very quickly, even when it gets soaking wet from swimming. I added a hat to keep the sun out of my eyes. 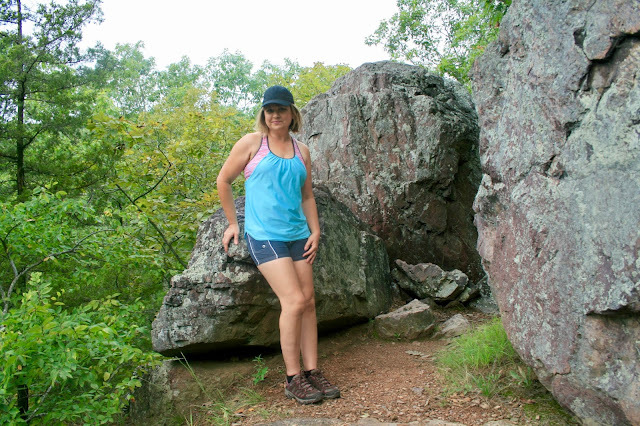 Because I knew it would be a day of strenuous hiking I wore Merrils on our morning hike, but then switched to water sneakers when I was rock hopping and swimming on our afternoon hike. Another day of hiking. This time it was cooler, in the seventies, so I chose leggings instead of shorts. Out came the same black athlesiure jacket I wore the day before, and also the same hat and Merril hiking sneakers. I kept my jacket on most of the day, only taking it off when we were in direct sunlight and climbing rocks in Elephant State Park. This is quite the snazzy work-out outfit and I will admit it wasn't my choice, but my husband's. We were shopping at JCPenney and he picked it out. I thought, "What the heck. Once in awhile I have to buy something he likes". It is different; I've certainly never seen anything like it before. The top is a metallic gold and the leggings match the top with the same metallic gold plus some black mesh. I like the leggings, but not the top. It's very clingy, showing every bump and bulge. I prefer my workout tops to be loose fitting. If you like this unique look, you can find the exact leggings and tank HERE and HERE. We went on a cave tour in the morning, then drove to our next pit stop in Rolla, Missouri. It was only 57 degrees in the cave so I never took my jacket off and I forgot to take a picture of the top. UGH! But I added a picture from the JCPenney site below this one so you can see what it looked like. The cave tour was about a mile and half long and a one hour 45 minutes tour. The trail path was steep and slippery at times, so I wore my Adidas Courtset Sneakers. I wore my black baseball hat again, only this time it didn't protect me from the sun but from water drips! I carried a cross body bag so my hands were free. My leggings are super old, but I'm sure I picked them up at JCPenney! This is the shirt I had on underneath my jacket. 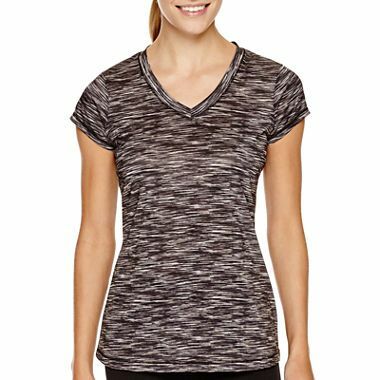 I bought two of these Xersion Tees from JCPenney when they were on sale for $5.00 each. They are activewear. This color is "Spacedye Neutral". I also purchased "Bold Fuchsia" which you can see on Day Seven. Surprise! We went hiking again. One of our most strenuous hikes ever. We also drove to Branson when we were done at the park, which was about a two hour drive. It was a warmer day, in the eighties. I wore the same style of shirt I had on the day before, only this time in a bold fuchsia. I wore another skort, this one in black. For footwear I alternated between my Adidas and hiking sandals, depending on the terrain we were hiking on. And of course, I had on my black baseball hat and carried a cross body bag. We did carry a back pack on the longer hikes, but if it was a shorter hike, I just carried my cross body bag to hold my phone and other necessities. When we arrived in Branson we were a smelly mess from hiking all day, so we showered and changed clothes before enjoying the Branson night life. I put on the same dress I wore in Day Two, except this time I didn't forget to photograph it. 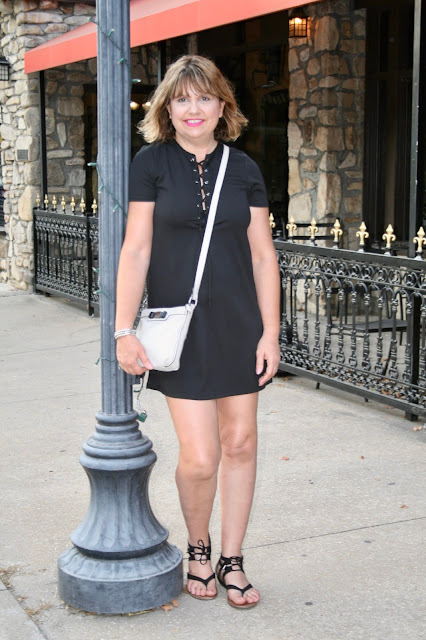 It's a very comfortable lace up shift dress. The last time I showed it to you was in this post HERE. We spent the day in Branson. It was a beautiful day, in the eighties. We started the day with a duck (boat) tour, then we went to the Sight and Sound Theater to watch the play "Moses" in the afternoon. 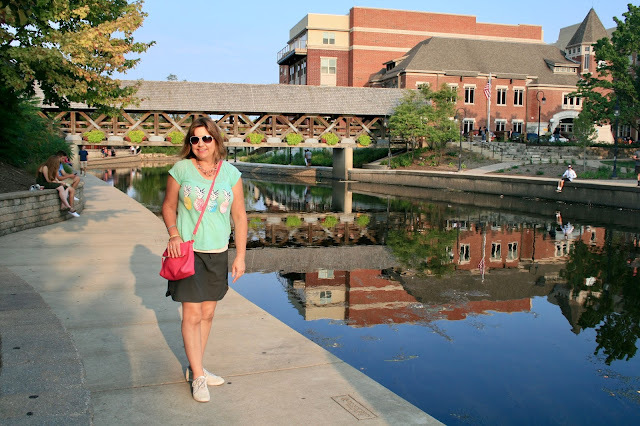 In the evening we drove to Springfield, Missouri to have dinner with my husband's family. It was a 45 minute drive. I wore the same floral shift dress I showed you on Monday's Fashion Post, only this time with heels. I carried the same cross body bag I carried most of the week, but this time I also carried a sweater in case I got cold on the boat ride or in the theater. On Sunday, Day Nine, we drove the eleven hours home. Expecting to arrive in cooler temperatures in Wisconsin, I just wore a pair of stretch denim jeans, a white tee, and the same black athleisure jacket I've been wearing all week. Only you can look truly cute in sports wear! You look so pretty in everything and your selection of dresses was perfect. Such leggy loveliness. 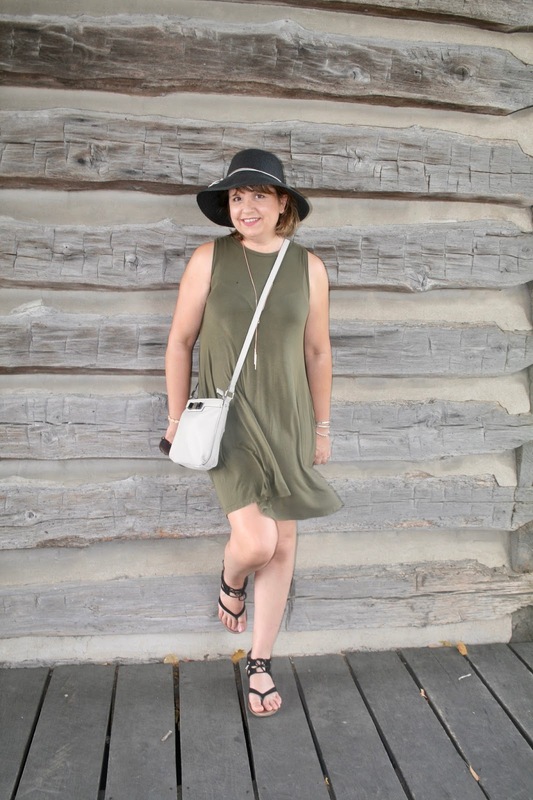 Especially cute is your olive dress and black hat outfit. You packed superbly, Amy. Ha-ha! Thank you! Your so sweet! Great looks, I especially love the olive dress! 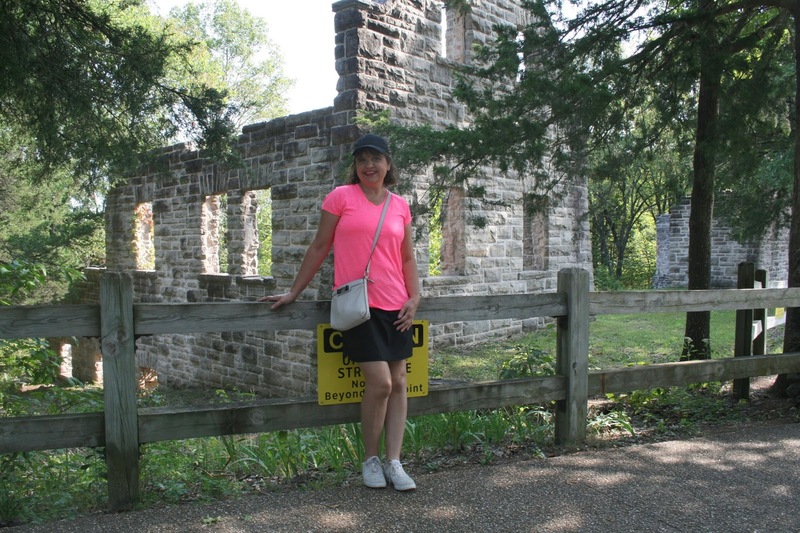 We took a trip to that area about 13 years ago, visited the "Jesse James" cave that's down there, a wildlife "drive in" park and then Branson. That's where we went on our first duck tour. It was a great time, but we didn't do any hiking because my son was very little then (not even one). Might have to plan another trip, so we can do some hiking. Looking forward to more of your travel posts about this trip. Thanks Elli! The olive green dress was perfect for the extremely hot weather. This was our second trip to the Branson area. We never hiked before either. 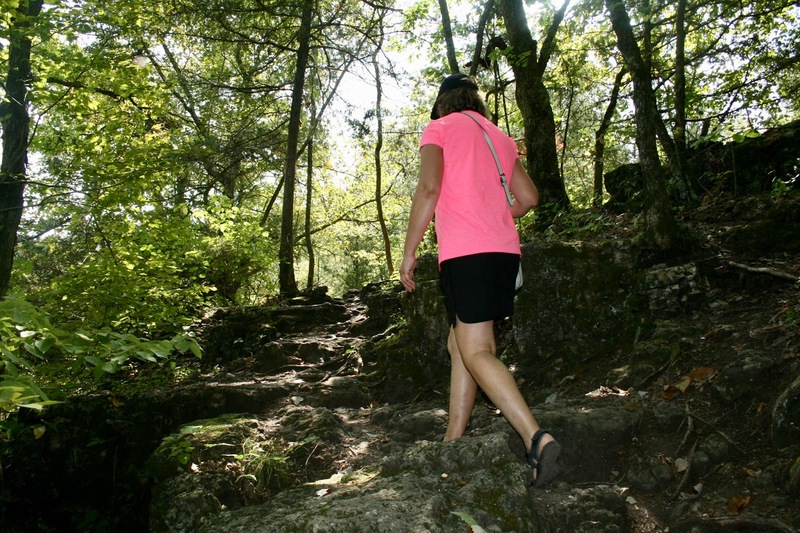 Your kids would love Elephant Rock State Park! Cute outfits Amy. Love the olive dress and the black dress looks. And how fun that you went hiking. You love outdoor adventures! Thanks Ada! Yes, my husband and I love to spend time outdoors! Wow, that sounds like an amazing trip and quite the workout as well. You certainly know how to "travel in style". Thank you for sharing your adventures and for joining my Fine-Whatever link up. Thanks Rena! Yes, we had a great trip, and hiked a lot...and I still gained 5lbs on vacation! Ugh! Too much good food! Thanks for linking up to Top of the World Style. No matter what you wear you always look so cute. You look stunning in all these outfits! Thus, there is nothing wrong to don the same outfit more than once! Thanks Nicole! You are so kind!